FIFTEEN DAYS till the spookiest day of the year...are you ready!? If not... have no fear! Today I'm sharing some of my past costumes to give you some Halloween inspiration. Last year, my friend Anna and I dressed up as Zoey and Quinn from everyone's favorite 2006 TV show. The essentials for Zoey? Blix, a Pear laptop, a key necklace, and a PCA shirt I made with an iron-on transfer. For my school's turnabout dance this year, the theme was "around the world." My boyfriend, Greg, and I chose to put on our best Parisian look and go as France. 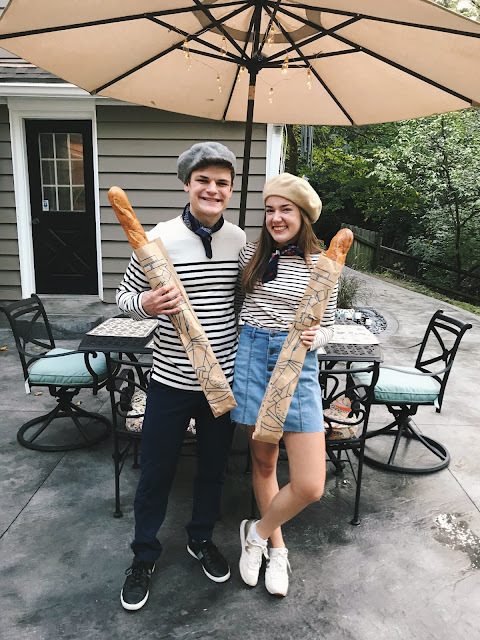 The baguettes are mandatory, and you'll also need a beret, neck scarf, and striped shirt. I completed my look with New Balances (restocked!) and a button denim skirt. I wore this look to a Grease Father-Daughter Dance at school. It was so fun twirling around in my poodle skirt! To look like you're straight out of Grease, you'll need a white short sleeve oxford, or any t-shirt, a poodle skirt (I got mine off Amazon), neck scarf (for your neck or around your ponytail), sneakers, and ankle socks. For last year's turnabout, which was decades themed, Greg and I channeled our inner Daisy and Gatsby to pull off a twenties outfit. I wore a flapper dress from Amazon, bow flats, costume pearls, and a black floral headband. If you haven't caught on yet... I go to a lot of themed dances. My school is pretty much obsessed with them, and I love it. 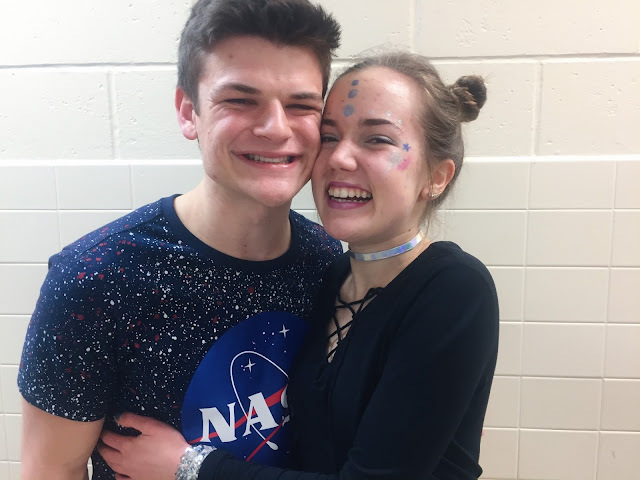 The theme for our spring dance last year was "out of this world." 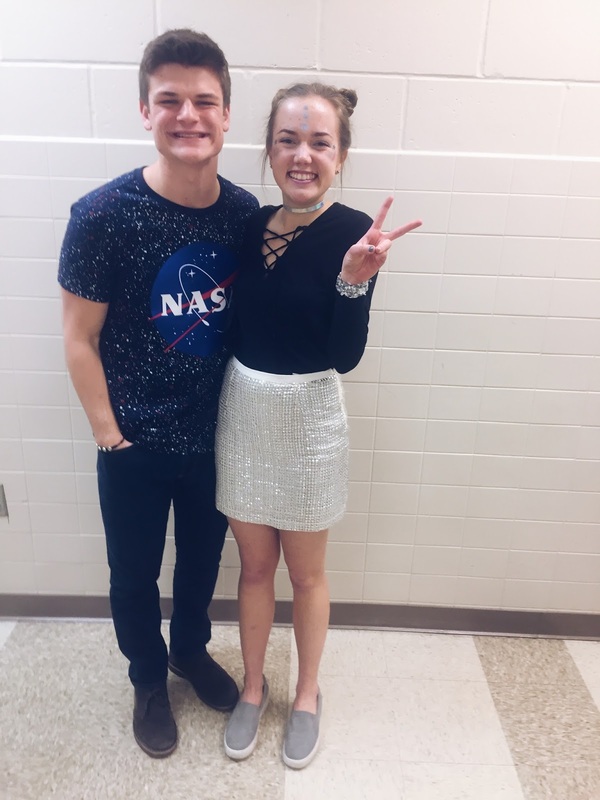 So, I went as an alien and Greg wore a NASA shirt. Copy my outfit: iridescent choker ($4), silver sequin skirt ($13), black lace up top ($20), and platform sneakers. Don't forget to paint your face and wear two high buns! Halloween season is definitely one of the most fun times of the year, and I can't wait to see everyone's costumes. As for me...I have no idea what I'm being. Very uncharacteristic of me, I know, but if you have any ideas please leave them in the comments! The "Frenchie" costume is so cute! I don't know what I'm going to be either, but this gave me a ton of inspiration! 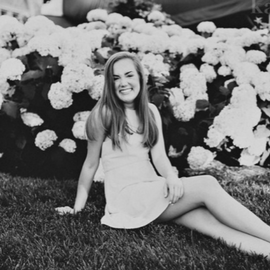 Omg MEG! I love all of these costumes and am totally stealing the Zoey 101 for Halloween this year! The Zoey 101 idea might be the best idea I've ever seen. I love it so much! These are absolutely the cutest- the Zoey 101 costume might be the best idea for Halloween I've ever seen!! !